The AS-4000 transcription kit comprised a foot pedal, headset and DSS Player Pro version 4 transcription module software. Using the DSS Player Pro version 5 software which comes with the DS-3400/DS-5000/DS-5000iD the DSS Player Pro version 4 transcription module can be updated, free of charge, to DSS Player Pro version 5 transcription module. 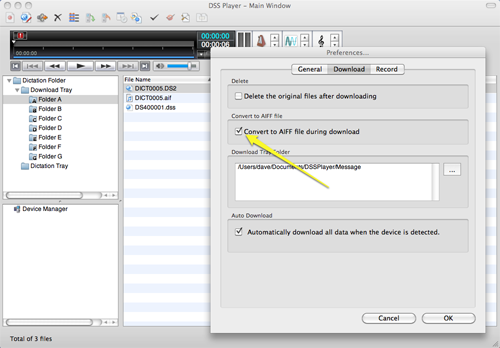 Thereby giving you a transcription kit compatible with the new .ds2 audio files. However, you must have an RS-28 transcription foot pedal, the older RS-26 transcription foot pedal will not function with DSS Player Pro version 5 transcription module. The upgrade will generate a new licence key specifically for the DSS Player Pro version 5 transcription module. You must write this licence key down and keep it safe. I suggest write it on a post-it note and keep it with the DSS Player Pro version 4 software CD and licence key. As you will likely already know, the functionality of the DSS Player Version 7 Plus on the Mac lacks some of the functionality of the DSS Player Pro v5 software for Windows. One key feature missing is the ability to set Classic Mode on your Pro Series recorder through the Mac software, this can only be done using the Windows dictation module. Therefore you will either need a Windows machine to install the DSS Player Pro v5 dictation module to change the default recording mode on your dictaphone or if you run Windows on your Mac using virtualisation software (VMWare Fusion, Parrallels, VirtualBox) you can set it using your Windows virtual machine. If you do not have a Windows machine available your options are: 1. Upgrade your transcription kit to an AS-5000 or 2. Auto convert on download all dictation recorded on your DS-3400/DS-5000/DS-5000iD to .aif format which can be transcribed by older Olympus transcription kits on Mac. On your Mac select Preferences and then click the Download tab. Then tick “Convert to AIFF file during download”, see below. The AS-2300 transcription kit comprised a foot pedal, headset and DSS Player Standard version 4 transcription module software. Using the DSS Player Standard version 5 software which comes with the DS-2400 the DSS Player Standard version 4 transcription module can be updated, free of charge, to DSS Player Standard version 5 transcription module. Thereby giving you a transcription kit compatible with the new .ds2 audio files. However, you must have an RS-28 transcription foot pedal, the older RS-26 transcription foot pedal will not function with DSS Player Standard version 5 transcription module. The upgrade will generate a new licence key specifically for the DSS Player Standard version 5 transcription module. You must write this licence key down and keep it safe. I suggest write it on a post-it note and keep it with the DSS Player Standard version 4 software CD and licence key. Using the DSS Player Pro version 5 dictation module it is possible to set the DS-3400/DS-5000/DS-5000iD to record by default in the .dss audio format, this is know as “classic mode”. This is set in the dictation module software itself and the setting uploaded to the recorder. View our video demonstrating how to set Classic Mode. This is the cheapest option for the transcription typist. The dictation module software is the same software that comes with the DS-3300/DS-5000/DS-5000iD, this can be installed on a Windows PC and can be used when receiving a .ds2 file simply for audio file conversion to .dss. If you are an independent or outsourced transcription business this is a cost effective solution as the AS-5001 (DSS Player Pro dictation module) is only RRP $160.00 incl. GST. 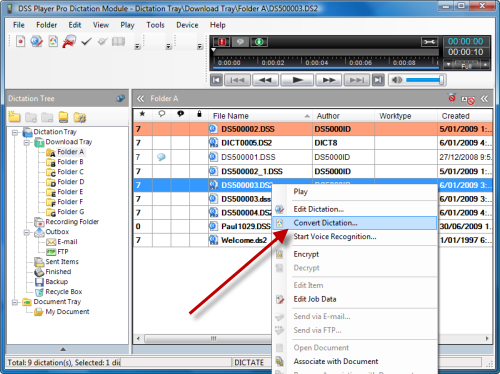 By using the DSS Player Pro version 5 dictation module you can continue to use Express Scribe. Do not be tempted to ask to borrow the software CD that comes with the recorder, the licence is a single user licence and would have been used and registered when the person using the recorder would have installed their software. This is for the serious transcriptionist. The AS-5000 kit comes with all you would need, Olympus RS-28 foot pedal, transcription headset and DSS Player Pro version 5 transcription module. This is the perfect accompaniment to the DS-3400/DS-5000/DS-5000iD recorders and can be set to automatically receive and load transcription from these recorders. All the features available in the dictation module are passed to the transcription module like prioritisation and audio notes. The RRP for the AS-5000 kit in Australia is $525.00 incl. GST – note this kit will accept audio from ALL Olympus digital voice recorders. It is not possible to set the DS-2400 to record in “classic mode” like the Pro series dictaphones. So this leaves the transcriptionist with only a couple of options. As just covered above, this is the cheapest option for the transcription typist. The dictation module software is the same software that comes with the Pro series recorders DS-3300/DS-5000/DS-5000iD and can be installed on a Windows PC for audio file conversion from .ds2 to .dss. If you are an independent or outsourced transcription business this is a cost effective solution as the AS-5001 only RRP $160.00 incl. GST. By using the DSS Player Pro version 5 dictation module you can continue to use Express Scribe. The AS-2400 transcription kit consists of a RS28 USB foot control, headset and DSS Player Standard transcription module. This software is capable of playing .ds2 audio files from the DS-2400 recorder. It can also play audio from the Pro Series recorders (DS-3400, DS-5000, DS-5000iD) however some of the audio functionality is lost when playing through the Standard transcription module. This is were we can take advantage of the generosity of Olympus. With each of the Pro Series recorders comes a single use licence for DSS Player Pro v5 dictation module for Windows and DSS Player Plus v7 for Mac. If the person doing the dictation has a Mac they will use the Mac licence. Meaning their Windows dictation module goes unused. The person dictating therefore has the option of giving this software (and therefore the unused Windows licence key) to his Windows based typist for him or her to use to convert the .ds2 audio from the person dictating to .dss format. The dictation module on Windows has the ability to convert .ds2 to .dss. On a Mac .ds2 can only be converted to .aif files, although .aif is a format that can be used by Express Scribe there is a large file size difference between a .ds2 file and a .aif file, this may cause a problem if emailing the file. Yes I have heard of issues using Express Scribe with DS2 files, especially in early releases. I would have thought these should be ironed out by now but maybe not from your experience. I have advised many people over the years that if you take on transcription as a profession or a service offered you must expect to pay some money for the software you need. In this case your best option is to purchase the Olympus AS-7000 transcription kit. Yes, more expensive than scribe, but it will work. Probably not what you want to hear. Thanks for your suggestion, Dave. Actually, after considerable research on the internet, it appears to me that the Olympus AS-2400 may be a practicable, affordable solution for my needs (let’s hope, anyway). I have spoken directly to Olympus several times in the last couple of days. They assure me that the 2400 will transcribe DS2 file formats so I have ordered the kit. The software, DSS Player Standard will work for DS2/DSS Pro I am told, and updates are free according to Desmond at Olympus. It was considerably less expensive on Amazon than anywhere else so I am keeping my fingers crossed that this will remedy my issues. It should be here within a week to 10 days so I will find out soon enough. Olympus recorder with background noise filtering (low-cut filter) on will also sound much clearer, this doesn’t apply to Express Scribe as it can not process Olympus’ audio filters so another benefit of the Olympus software. Keep your software licence key safe. You will need it if you buy a new computer in the future and need to re-install the transcription software. I appreciate the reminder about the software license key. Now that I have ordered AS2400, would you happen to know of a good “converter program” to convert any *.dct files that I may be sent, so that I can transcribe them with the AS-2400? I had previously used an older version of Express Scribe just fine but now that NCH took away the foot pedal controller on the free version, I need a way to transcribe those file types and hate to pay for defective Express Scribe Pro. I would try the free version of Wavepad from NCH, as you already have the Sony plugin installed to play your .dct files Wavepad should be able to play and also save the .dct to an mp3 for you to play back in your Olympus kit. Or you can hunt down an old version of Scribe (I think from memory 5.3 or earlier) that will play and also convert .dct files. Please let me know how you go. If no good I will look into it further for you. Hi: NCH claims to play .ds2 but in actuality it wont. Their file converter although they claim converts .ds2 files, but it wont. Their support team wont help you out. I recommend not to purchase any software if you have .ds2 files. Just by Bytescribe player, it supports .ds2 and you can play files using pedal as well. Thanks for your comment. Yes we have heard of and written about the issues with Express Scribe and .ds2 audio files. As a reminder the ds2 audio format is a proprietary format. This means it is owned by someone and as such you need the owners software to play it. The people who own ds2 (Digital Speech Standard) are Olympus, Philips and Grundig. All three are leaders in the digital dictation and transcription world. Save yourself time and trouble and just buy the right software for your needs. If you are a transcription typist don’t scrimp on something you will use every working day. Transcription software for a transcriptionist is as essential as the Windows operating system and Microsoft Word. You rarely hear typist complain about the cost of Windows (or Windows upgrades) or the cost of Microsoft Office, either an Office Suite or Microsoft 365. You don’t see typist use and open source operating system link Ubuntu or switch to Open Office. The same should apply to your transcription software. From Olympus to transcribe ds2 audio you will need the Olympus AS-7000 Professional Digital Transcription kit which some with the software you need, USB for pedal and transcription headset. I tried downloading both the samples given at the end of the post but I was redirected to iCloud home page. No download option was available there for these files. Yes this was a post for long ago when we could share files via iCloud. If you email us we can send you a couple of sample files and we will work to update this post in the near future.